Liz Earle Eye Bright // I've lost count of the amount of bottles I've been through of Eye Bright since I discovered it probably about six years ago now. I started off using it as an eye make-up remover but I was going through the bottles so quickly it was becoming an expensive habit. Then I discovered cheaper micellar waters and this has been saved for days when my eyes are irritated or are need of a pamper. Simply pour some onto a cotton pad, place on your eyes and relax for ten minutes while it works its magic. To avoid postage I tend to buy two bottles at a time so I still have one more to finish before I need to repurchase again. 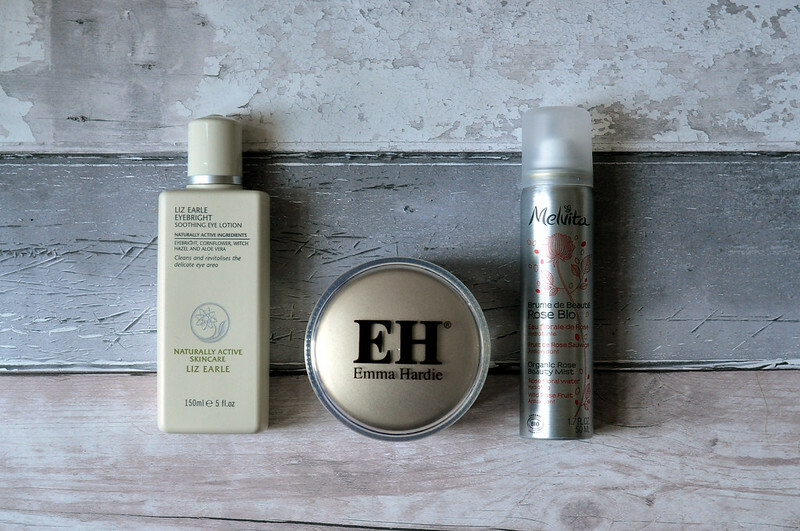 Emma Hardie Moringa Cleansing Balm // I’m sad to have finished this tub and I really enjoyed using this cleansing balm. Not only is it a dream to apply and use, it also makes my skin clean without stripping it. Instead it’s one of the more moisturising balm cleansers I’ve tried. It doesn’t leave your skin feeling greasy but it does leave your skin feeling softer and hydrated. Melvita Rose Beauty Spray // I’ve had a bottle of the Melvita Rose Water before but as a normal spray bottle and not an aerosol. I’m pretty sure they’re both the same products but just in different packaging. At least they looked, smelt and acted in the same ways. While I enjoyed using this as the hydrating toner step in my skin care routine, I’m not sure it really did much for my skin apart from feeling nice. Aesop Resurrection Hand Balm // I really love this hand cream but towards the end of the tube it was irritating my eczema which had flared up quite badly. This is simply down to my hands being so sensitive they reacted to anything I tried apart from a Neutrogena unscented hand cream so it wouldn’t put me off buying this again as I never had a reaction before. It’s not cheap especially if used on a daily basis as I went through the tube quite quickly but as a treat every now and again is nice. This Works Sleep Balm // I tend to use this sleep balm as an overnight treatment on my hands as I get the benefit of the moisturising balm with the relaxing lavender scent. A little bit goes a long way so this mini tub did last me a long time although it wasn't something I used on a daily basis, just when I needed a relaxing scent to help me drift to sleep. I already have another tub to use before I have to repurchase again. The Body Shop Blueberry Body Scrub // This is another body scrub from The Body Shop that works a lot better on dry skin than wet. This has more of a gel texture and looked pretty much like you are rubbing blueberry jam into your skin. I think I have another tub to use as well as the raspberry version so don't need to buy another body scrub for a while. 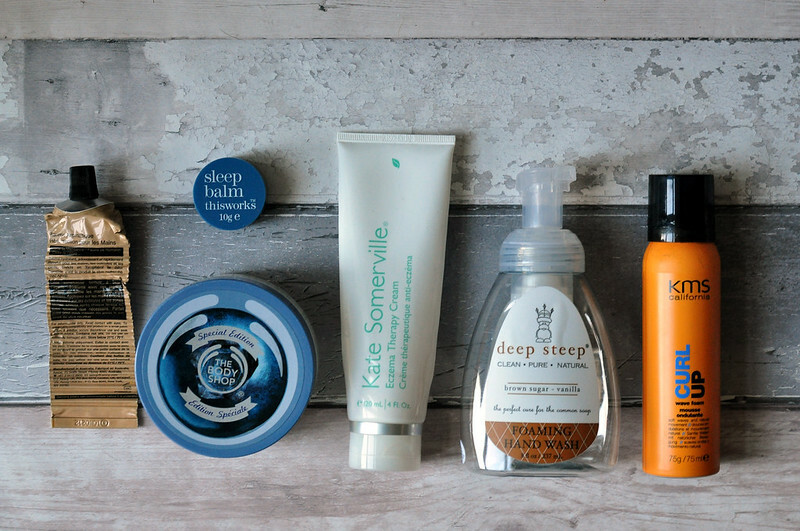 Kate Somerville Eczema Treatment // I'm always on the lookout for products to try for my eczema and this is one of my favourites. I went through it very quickly considering it costs $48. I also used it as an all over body moisturiser since I get eczema anywhere and everywhere but it would obviously last a lot longer if you only used it on certain areas. It sunk in very quickly and didn't leave my skin feel sticky which usually irritates my eczema. It also doesn't contain any fragrance and reminds me a lot of First Aid Beauty Ultra Repair Cream which I have repurchased now I've ran out of this. I will buy a tube of this again at some point and will probably miss being able to reach for it but to spend $48 plus shipping regularly is a bit too much. Deep Steep Brown Sugar Vanilla Foaming Hand Wash // I really didn’t like this hand wash although it did work well enough. It was the scent that I really didn’t like which I wasn’t expecting. You can’t really go wrong with sugary vanilla scents but I think I started using this just after I had a 24hour bug and the scent makes me feel a bit sick. I’m currently using the lavender version which I really like the scent of so it’s definitely just me! Lush Shoot For The Stars Bath Ballistic // This has the same scent as Honey I Washed The Kids soap and I only put the two scents together when I read it on the Lush website. I really loved this bath bomb as it was a lot more moisturising than some of the other bath bombs. I also love the effect it gave as it started off with a few different colours but then the water turned a dark blue purple just like the night sky packed full of silver shimmer like the stars. If this wasn’t limited edition I’d definitely buy it again and I might try and buy a few if it’s in the sale. Lush Lord Of Misrule Bath Ballistic // This was part of the halloween collection although it didn't really look it, compared to the other products on offer. The scent is patchouli and black pepper which I wasn't sure if I would like but it's actually quite nice. It was green to start off with which then turns to a pink-purple. It's meant to be packed full of popping candy but I couldn't really hear anything. KMS California Curl Up Wave Foam // I loved this when I first started using it but for some reason towards the end of the bottle, no matter how little I applied it started to make my hair feel sticky when it was dry. This really helped to enhance my natural wave/curls but I’m testing a few other products out at the moment to see if I can find a better all-round product. I’m sure I’ll buy the full size of this at some point though. That Liz Earle eye tonic sounds delightful!! I have so many Lush products to use up as Santa kindly gave me lots this year!